Begin this excursion with a climb up RanoKau volcano. The trail crosses a small forest of palm trees and then one of eucalyptus, with spectacular views over Hanga Roa. After a short while, a solitary tree is reached that offers its welcoming shade and pinpoints the volcano’s main vantage point. RanoKau is the third highest peak on the island at 283 m (928 ft.) with a huge crater lake (1.5 km – 0.9 mi. diameter) and a fresh water lagoon serving as Hanga Roa’s most important reservoir. The volcano’s eruption, over two million years ago, is partly responsible for the origins of the island. Later, a narrow trail leads to the right side of the volcano where the Orongo Ceremonial village lies. 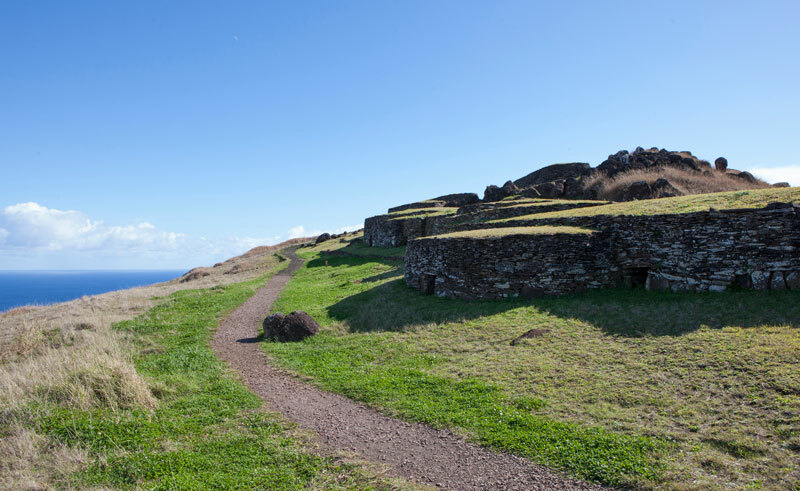 Here you can explore boat-shaped dwellings, see the island’s highest concentration of petroglyphs and learn about the origins of the birdman cult that became popular after the end of the moai construction period.